Foosball, Pool Table, Air Hockey and Ping Pong! Bring the whole family to this rustic, fun-filled mountain cabin and make lasting memories! The main entry level has an open floor plan with living area with wood burning stove and large smart flat screen TV (movies only) so you can connect to your own Netflix, Amazon, etc., dining area and huge open kitchen. Enjoy relaxing on the covered deck just off the dining area. Main level has two bedrooms, both with Queen beds. The master has a soaking tub and shower and there is also a 1/2 bath for everyone to use on main level. Head on up to the loft for a game of foosball. Loft area has open sleeping with two twins, a trundle bed and a extra large cushy sleeping bed. Loft also has a private bedroom and a screened sleeping area both with queen beds. There is a full bath in loft with tub/shower combo. Everyone is going to want to hang out in the unfinished basement game room! A second living area with flat screen TV and large sectional sofa makes family movie time extra special. Don't fight over all the games - there is something for everyone. Standard pool table has ping pong table overlay and a separate air hockey table will entertain all the kids OR adults for hours. 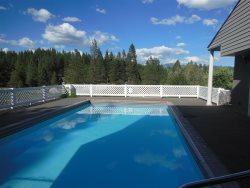 This cabin offers access to the private subdivision hot tub and pools, just down the road! In the evenings gather round the outdoor fire pit and break out the s'mores! Centrally located, just minutes away from everything Crouch and Garden Valley have to offer. Bring your toys - there is plenty of parking. For larger groups and family reunions, grab the cabin next door - Forest Glen - to sleep a total of 25 people!